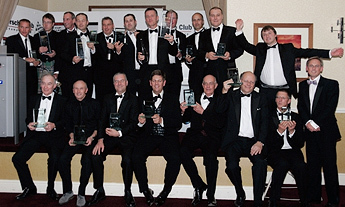 Trophy Winners featuring Chris Dyer winner of Class II and last years overall champion, and collecting team trophy on behalf of Dave Forrest of Strasse are Richard Ellis Paul Ward and Chris Whittle. 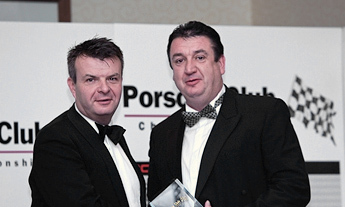 Dave Forrest with Geoff Turell of Porsche Cars GB. 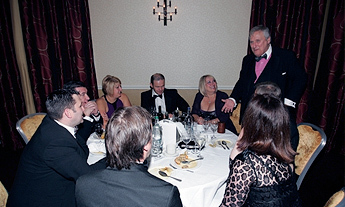 Strasse Table being entertained by Magician With Dave Forrest and Lindsay, Chris and Sue Dyer, Richard Ellis Paul Ward and Eileen and Chris Whittle. Dyer wins Class Two Championship - Strasse secures Team Championship! 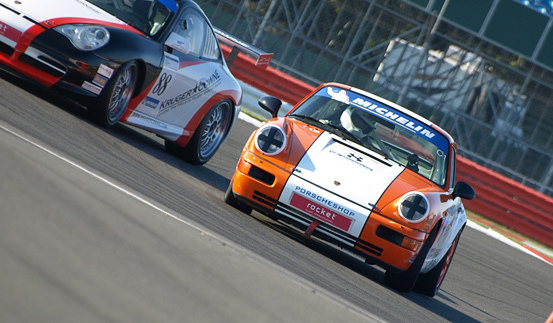 This weekend (Oct 1st 2011) Silverstone played host to the final three rounds of the Porsche Club Championship who where sharing the track with the Porsche GT3 Cup Challenge field, racing on the new Silverstone Grand Prix circuit for the first time with an impressive twenty two car field, thirty one if you include the GT3 cars. Chris Dyer was on target to take the GT2 championship but the overall championship was still alive between Dyer and the Class one leader Mark sumpter and with three races still to race over the weekend the title was up for grabs. Due to points dropped earlier in the season because of the small Class 2 fields Dyer was hopping that Sumpter would be pressurised into making a mistake and give himself a chance of retaining the overall championship title. But both pilots made a perfect start to the weekend on Friday afternoon with both dyer and Sumpter winning there own classes. Dyer was leaving nothing to chance this weekend and was not going to let anyone get in the way. this was apparent after Dyer exchanged paint work with Marcus Carniel early in the race, apart from the battle with Carniel it was an easy race for Dyer taking the chequered flag ahead of Carniel. 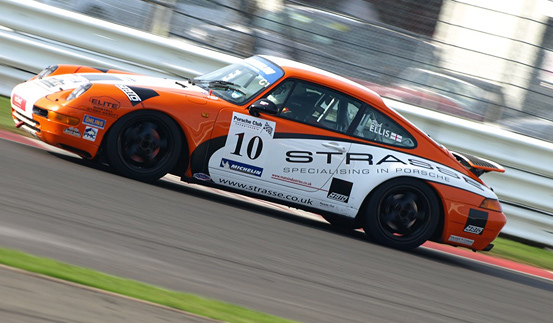 Richard Ellis piloting the Strasse Porsche 993 C2 fell foul of traffic on the first lap and despite setting good lap times it was too late to catch the leading pack coming home in seventh place. The third Strasse pilot David Botterill in the Porsche 964 started on the last row of grid after a poor qualifying season, It was going to be a fight to get among the leaders for Botterill but straight away he was involved with a battle with Karim Moudi a battle that practically latest the full race, Botterill eventually came out the victor taking the finish line in thirteenth place. Race two on Saturday morning was packed with action and with Richard Ellis putting in a impressive race taking third place from Mark Sumpter, Ellis admitted that he was still getting used to the new Sliverstone layout during race one was laying down the gauntlet and almost took 2nd place after darting down the inside of Marck McAleer but had to ease off due to an GT2 car coming through the pack. The podium spot meant that the Team championship was looking good for Strasse Motorsport and also for Chris Dyer who again won his class ahead of Marcus Carniel after overtaking him on the grass after they both spun off after hitting oil on the track. Carniel was not best pleased and accused Dyer of over taking him on a yellow an accusation that was was not accepted by Race control. 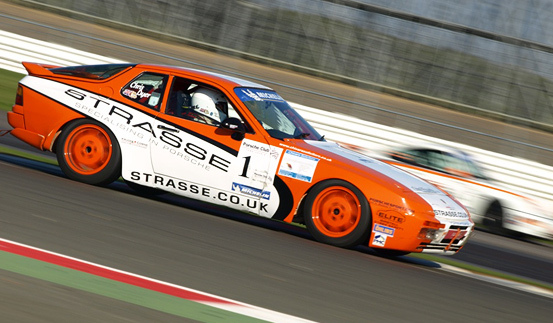 David Botterill brought home the third Strasse car in thirteenth place. With Sumpter only taking fourth place and Dyer winning both races the overall championship was blown wide open for race three, if Dyer won his class and Sumpter came fourth or less Dyer would retain the the number one and it almost happened after Sumpter dropped places on lap one into third place Peter Morris was on the tail of Sumpter all the race but was unable to take him crowning Sumpter overall champion, only four points in front Chris. Dyer was faultless yet again pulling away from the field right from the start and also his closest rival Carniel taking the class two win and also taking the class championship and the Team Championship. David Botterill got off to good start and was looking good but a mistake made under a yellow flag meant that Botterill dropped three places and lost the pace to regain the gap finishing in the middle of the pack. Richard Ellis put in a strong performance coming home in fifth place after spinning off with Sumpter after a slight contact between them this also allowed Peter Morris to get by and take fourth place. I got an absolute cracking start passing a few right from the start and I soon got on the tail of Marcus Carniel and kept behind him for a couple laps just to let him know that I was there, I out braked him going into a corner got passed him and managed to pull away from him, he spun off shortly after battling with Paul Follett so I just kept the same pace from then on and came home first. In race two I once again got a absolute flying start, I came through Beketts and Maggots and came off. I went flying off the circuit but came flying back on nearly wiping Paul Follett out but I managed to get up the back of Marcus Carneil we then swopped and changed for all the race but on the back straight there had been some oil laid down and we both spun off, he clipped me and I went passed him on the grass and from then on I just had to keep him behind me, some of the back makers and the GT3 leaders did not help but managed to hold on. It was a good race apart from Mr. Carneil trying to appeal against me, but a very good race I can’t wait until the last race. Once again in race three I got a fantastic start and got passed a couple of cars straight away apart from Richard Higgins coming down the inside and nearly wiping me out and that after he said he was not going to do any thing like that I just pulled away from Marcus Carneil who was second and just kept plugging away, I just did what I had to do, I won all three races for the weekend, job done, could not do any more, that’s it for the season. Qualifying went pretty good and the car handled well, but it took a long time to get to know the new circuit, I just could not get on top of it. Race one I managed some how to get bogged down from the start that resulted in me spinning the wheels and got blocked going into the first corner and from that point forward I had a fight on my hands, but I enjoyed the race and made good progress throughout the race and I got more used to the circuit as the laps went buy. I had some very good battles with various drivers and ended up have a battle with Richard Bennett. Race Two I got a good start and ended up tucking in nicely into the first corner I was running the car on new tyres and they felt really good and with the parade lap they had bedded in nicely, I kept pushing forward and had a good battle with Peter Morris early on in the race and took him mid way through I then was on the tail of Sumpter and managed to get in front of him moving me up into third place, the car handled great and I was able to keep third place. In race three I had lets say an average start and to be honest a few drivers anticipated the flag a little better than me, I got blocked on the first few corners but managed to keep up to the leading pack, I tried to take the inside of Sumpter going into Chapel corner and clipped him nearly spinning the both of us but we both managed to carry on with Sumpter getting the better of me leaving me to battle with Pete Morris but in all I had a great time and good race I just need that little bit extra but to some up it’s been a great weekend. Race two was the same as race one but in race three I got a good start and got past Marcus Carniel who gave me a little tap and pushed me wide and he got passed again I then started to get pressure from Moudi and a few others they came from behind and a little late into the race I messed up because yellow flags where out and what I thought was a safety car board turned out to be hazard board and lifted off and Moudi went passed me and I spent the rest of the race closing the gap I had unintentionally created but got him on the last lap after he spun in front of me after pressuring him.